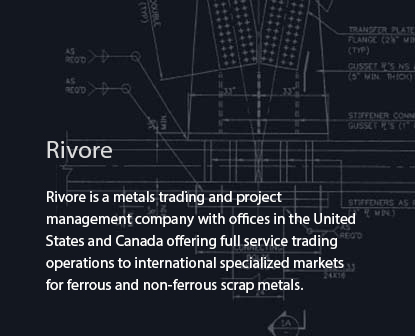 As the flexible supplier of all material requirements to numerous mills and overseas buyers, Rivore has built a reputation for agility, creativity and integrity through strong supplier and processor relationships. Commitment to customer service, experience and financial stability, coupled with direct transportation relationships enables us to maintain and manage an extensive fleet of rail cars dedicated to scrap delivery throughout North America. This positions us to best serve the needs of processors and Consumers of all sizes, including numerous major firms, in both the domestic and international markets. Rivore is committed to following the R2: 2013 and RIOS requirements. We are committed to continually improve processes to prevent pollution and workplace injuries. See our complete Quality, Environmental, Health and Safety Policy. Rivore provides a fully integrated range of services for the resource recovery industry.